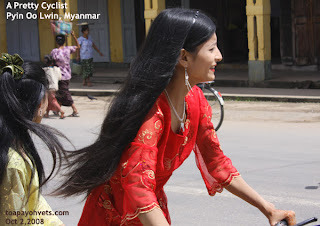 November to April is the best time to tour Myanmar as there are no more rainy days. From the various tourism people I spoke to, the tourism business has been down for the last two years and many people have lost their jobs. The tour is extremely interesting for those who love nature, farming and digital photography in a safe and friendly country. It will not be the comfortable coach ride when you travel in New Zealand or Australia. Some coutnry roads are full of pot holes, a bridge across a creek may be under repair, there may be spiders and small insects and many unexpected happenings like black outs in hotels and restaurants. In summary, this travel is more an Indiana Jones and Romancing the Stone type of adventure travel and will not be suitable for those Singaporeans who love air conditioning and a very clean environment like Singapore. In that case, goto the USA, Australia and New Zealand. However, every tourist contributes a bit to the economy of Myanmar, a country which is very safe and beautiful to tourist. Europeans, especially Germans and Swiss appreciate the culture and beauty of Myanmar and seem to go mainly to Bagan and Mount Popa. 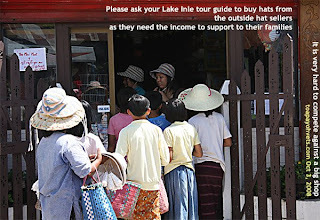 Singaporeans seldom, if ever, tour Myanmar as they have many misconceptions about the safety of travel in the country. discover Shwedagon Pagoda and its Magnificent Golden Stupa in the evening. 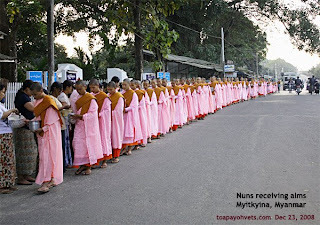 After breakfast, transfer to the airport take your flight to Myitkyina . the Myanmar. Check-in to the hotel and excursion to Myitsone and Kayeinnaw. After breakfast at the hotel, drive to Inndawgyi Lake about (7) hours. villages on the way to Inndawgyi Lake . Check in the Military Guest House. Have a breakfast at the guest house. Back to guest house and proceed to Myitkyina at 6 am. Dinner at local restaurant and overnight in Two Dragon Hotel. Dr Sing's comments. Leaving at 6 am. Misty mountain roads to valley. 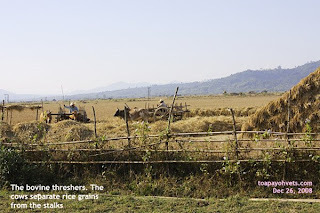 Long stretches of farmland and many villages - Rice farms mainly. 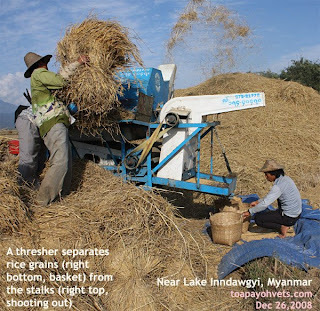 Rice harvest completed for most farms but the tourist can see many farming matters like ploughing, threshing and vegetable farms. Bright sunshine. Cool climate despite being winter. 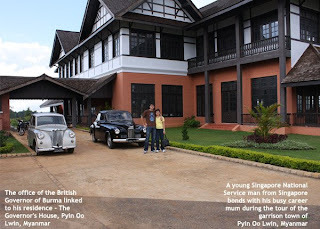 Hotel, dinner & overnight in Pwin Oo Lwin. After breakfast at the Hotel, enjoy the beautiful panorama from you resort. flight back to Yangon . Take the International flight back to Singapore. 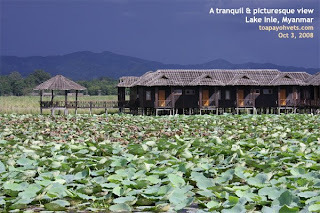 Our tour guide had already booked the villa accommodation in Lake Inle. When one of the ladies checked in, she saw several small spiders on the bed and was unhappy. Some people suffer from insect phobias - even small cockroaches cause their hearts to beat much faster and great anxiety overwhelmed them. 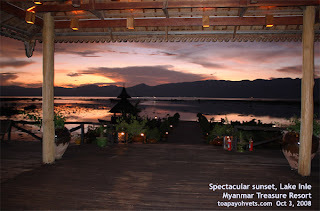 Towards sunset, our tour guide asked me whether I would like to visit a hotel called Myanmar Treasure Resort, Lake Inle. I said yes. 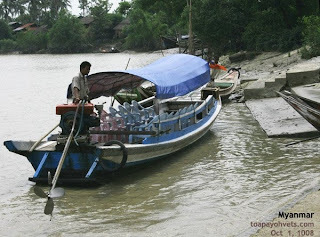 It was a long boat ride with waves spilling water at the front of the boat. Dark grey clouds mushroomed on my left enveloping most of the sun. Pink orange hues against greying skies. It was one of those sunsets seldom seen in Singapore. 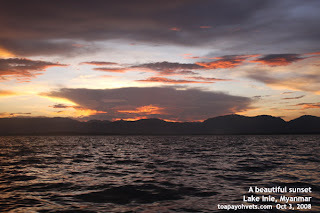 One famous travel guide mentioned about the spectacular sunsets at Lake Inle and we were viewing on such sunset. 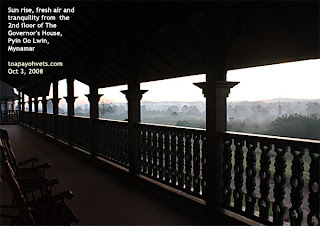 At the Myanmar Treasure Resorts, the magical spell of the sunset cast its spell. Cool evening. Slight breeze. Quiet. No mosquitoes. No guests on that evening. "Can you get the hotel manager to give a 50% discount?" I asked my tour guide. After all, there was no guests at all. "It is not possible," the guide said. "October is the start of the peak season." "Why not try?" I knew the guide did not want me to incur more expenses as there was accommodation booked - the place where small spiders had crawled on the bed. I would have asked the manager myself. But I understand that the guide earned her livelihood from commissions given by the hotel for getting the guests to stay in the hotel. If I did it, she might not get a commission as she did not introduce the guests. This was the right thing to do but many Asians have no qualms about cutting out the agents. The tour guide succeeded. There was a shout of surprise when one of the ladies saw the bathroom. Such bathrooms are rarely seen by the average Singaporeans. There were no spiders on the bed. We had an excellent dinner at this hotel. The manager gave us a complimentary chocolate cake. I did not ask for it. This episode showed that one has to be proactive and acquire a positive mental attitude in life. Ask and you may be embarrassed for being a cheap-skate trying to stay in a 5-star hotel. If you don't ask, you don't get rejected. If you ask, you may be given what you want. 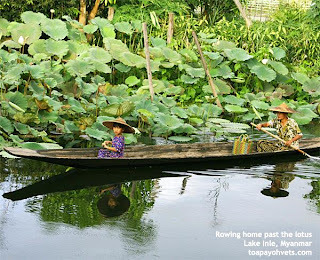 Lotus plants in Lake Inle appear much bigger, greener and healthier than those seen near Yangon. 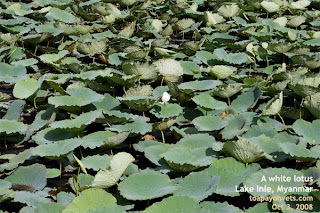 This shows that Lake Inle is not polluted and the lotus flourishes and blossoms well. The fibers of this plant are used to make lotus cloth. The price is too expensive even for most tourists to buy. Sometimes you will get surprises. 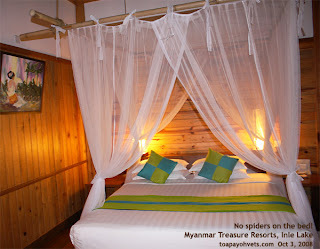 If you see small spiders on the bed of the waterfront villas of Lake Inle, what do you do? City dwellers will complain to the hotel staff. They don't expect spiders on the bed. What do they do? In this case, the hotel girl brought in a large long greenish insecticide can. It looked like a Bayer spray can. "What do you use this can for?" I asked the hotel girl as she entered the room, all ready for action. "It is used against cockroaches," she said. I shook my head. How could she spray against the small spiders on the bed. The whole bed will be smelling of insecticide spray. The lady did not spray. If you see small spiders and their cobwebs on the bed, use a tissue paper and catch them. Release them outside the hut. No need to kill them. I heard some scattering running noises on the thatched roof but kept quiet. Singapore girls are afraid of rats and if I say "rats", they may scream. When we travel to the countryside, expect some small spiders and insects. Tarantulas are rare and if you do see them, be alert and inform the hotel staff. As for small spiders, let them live. Be Kind To Spiders. 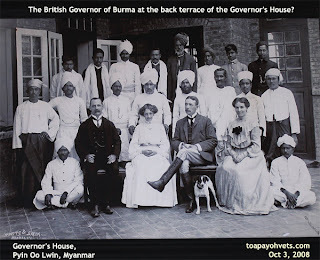 A garrison town filled with history and many British colonial houses. For example, The Governor's House. 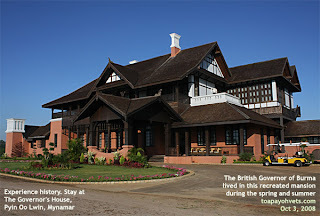 Another 3 government hotels which were built during the British colonial days. Cool air. 3 hours' drive up the mountains from Mandalay. Has a botanical garden. Horse carts, flowers and fruits, plantations. 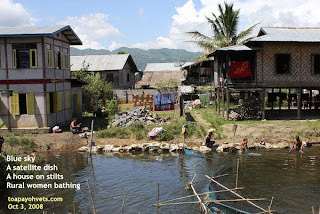 Should relax and explore for 2 days here but has to rush off to Lake Inle after 1 day's stay. 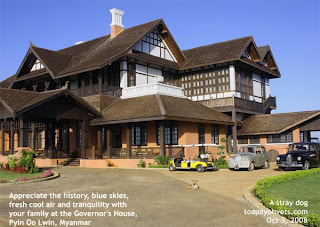 The garrison town of Pyin Oo Lwin has a cool climate in October 2008. Plantations and farms in the surrounding areas. A good place to live for at least 2 days for stressed-out Singaporeans and their families. A slower pace of living. 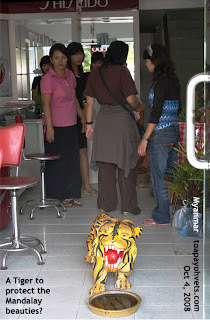 You will get to drink Singapore's Tiger Beer there too. 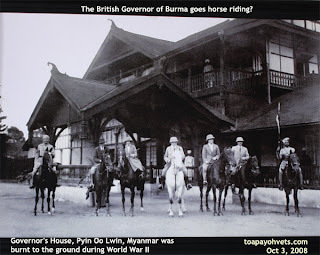 It appears to be the meeting place for veterinary undergraduates studying at the university in Nay Pyi Taw which is now the "new" capital of Myanmar. 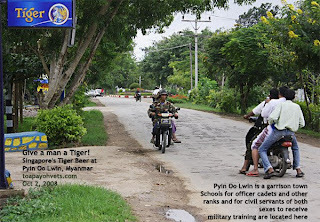 Foreigners wanting to visit Nay Pyi Taw will require permission to do so. In December, lots of sunflowers and wild parrots at The Governor's House, according to The General Manager. 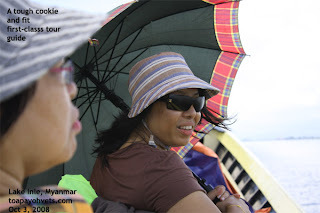 Peak season for tourism in Myanmar is after the rainy season - November to April. 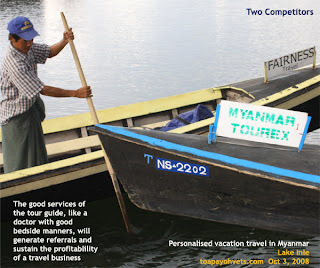 To find out whether starting up a tourism business in Myanmar will be a viable business in Singapore. Photographs are needed to document this trip. Day 1 - Wed October 1, 2008 The Strand, Yangon. - Historical - Luxury accommodation . Day 2 - Thu October 2, 2008 Governor's House at Pyin Oo Lwin. Historical - Luxury accommodation. Day 3 - Fri October 3, 2008 Myanmar Treasure Resort at Lake Inle - Waterfronting, Luxury accommodation. Day 4 - Sat October 4, 2008 Sedona Mandalay Hotel, Mandalay - 2nd largest city. Day 5 - Sun October 5, 2008 Mountain View Hotel - Tin Roofed, near Golden Rock Pagoda. 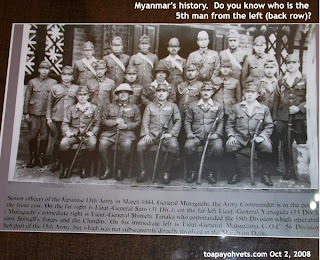 Above-mentioned Singaporeans have not been to Myanmar. "Is Myanmar a dangerous country to visit?" Jason asked his mum. 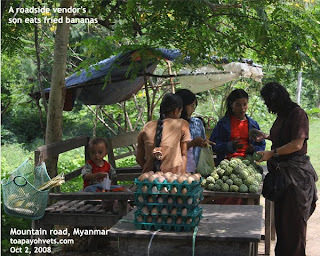 So little is known of Myanmar in Singapore except for sensational political reports in the English language newspapers and some famous travel books. 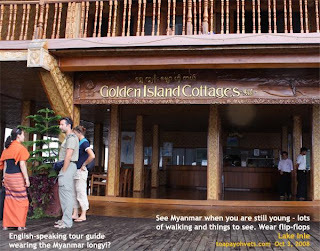 Very few Singaporean residents tour Myanmar and few travel agencies offer advertise such tours. 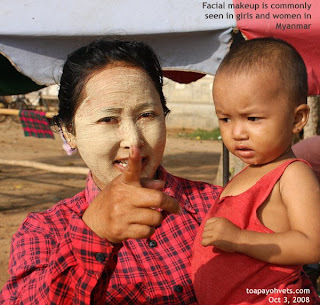 Yet, Europeans especially Germans, people from Thailand and China do visit Myanmar in large numbers. The former love the gentle culture and land. The latter two go for the Buddhism cultures and pagodas. 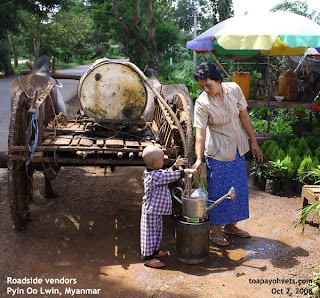 My short exploratory expedition in October 2008 showed that Myanmar is a safe country and has lots of culture and views to offer the Singaporeans and photographers. 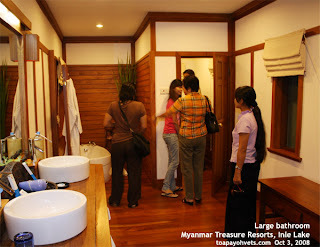 There is a prospect of starting up a niche tour to Myanmar in collaboration with the Myanmarese travel agencies. How to do it depends on the person who views a glass of water? The person who views a glass of water as half empty can see no way can there be a viable travel business. Another who views a glass of water as half full sees limitless opportunities not only in the travel business but in other aspects still unexplored in a country that is gradually opening up to the world. 1. An unforgettable expedition for city folks who have only been to well developed countries like Europe and Australia. 2. 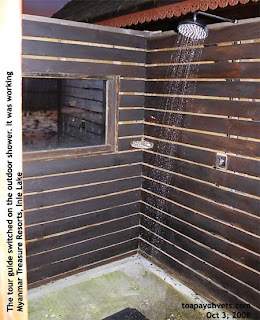 City folks who wants to connect with Nature. 3. Develop of an understanding of the hard life of farmers in a country of 55 million people. 4. Numerous opportunities for photographers who love culture and nature. 5. History and culture tour. An appreciation of the colonial history and Buddhism as there are several thousands of pagodas. 6. Appreciation of being alive and being able to do the following in a smog-free environment in the countryside - seeing beautiful sunset on Lake Inle, breathing the fresh misty air of the Golden Rock mountains, touching the clear lake waters and foliage of Lake Inle, seeing golden rice fields, small farm holdings of ducks, pigs. See rubber and other fruit trees and flowers and the development of a big country. 1. October is a good time to visit. May to October is a rainy season and November to March is the best time to visit and also the peak tourist season. 2. 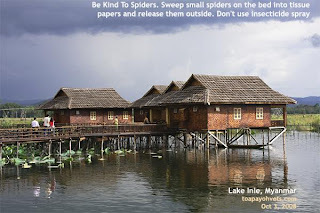 Insects like small spiders in hotel bed in the Golden Island Cottages Hotel at Lake Inle may upset tourists who are not used to having insects in their office or house. Dead and live moths lying on slippery marble floors of Golden Rock Pagodas may upset such tourists too. Surprisingly, few mosquitoes were present in the places visited. 3. Only one thunderstorm was encountered in this visit. It was on the way up the mountains to see the Golden Rock pagoda. It was a most memorable trip. 4. Bumpy rides with little leg room in large lorries up the Golden Rock pagoda hotel. Pot-holed roads on the way to Yangon from Bago. 5. Pitch-darkness 1 am to 5 am in Mount View Hotel, near the Golden Rock Pagoda during the off peak season - to prevent transformer from being "hit" by lightning. No written notice in the hotel room. A torch-light was available but the guests were not informed. So, it was "total blindness" in the bedroom - can't see a cm in front when guests wake up at 1 am to 5 am. This can cause quite a fright for Singaporeans who are always used to having no blackouts. 2 electrical power failures during dinner in Sedona Mandalay Hotel lasted less than 5 seconds. Quite a surprise for Singaporeans not used to blackouts. 6. Machine-gun rattling of rain on the tin roof of Mount View Hotel near Golden Rock Pagoda overnight due to the thunderstorm. Drum beats in Sedona Manadalay Hotel's nightclub heard on 3rd floor. 7. A need to change the Singaporean mindset of efficiency and being productive as the lifestyle in the countryside is simpler. 8.1 No room internet access in some hotels. Singaporean teenagers and youths addicted to online gaming remember this deficiency but are usually tired out to do any surfing. 8.2 Lorries with tight benches rounding up the mountain road to the Golden Rock can be "traumatic" to the backs of Singaporeans not used to such bumpy rides. Similarly, pot-holed roads and bumpy rides can be either a joy or a suffering for Singaporeans. 8.3 Heat in Mandalay is a common complaint from Singaporeans used to air conditioning. 1. Camera lens cover slightly cracked on steps as I fell on alighting from the boat after visiting a water-located pagoda. 2. 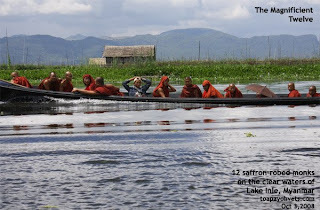 Camera - Lakeside waves of Lake Inle could have overturned the boat. My camera was not kept in any waterproof bag and therefore could be ruined. It would not be able to buy a good replacement Canon EOS 40 camera in the countryside. 3. Camera - Thunderstorm and rain on the way up to the Golden Rock pagoda carried by the locals on a stretcher for around 30 minutes uphill at 7 pm could have ruined the camera too. 4. Camera - Lack of telephoto lens as I used the standard lens provided for by the manufactuer, missing out great shots. 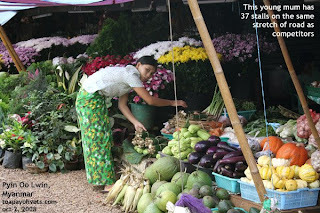 Myanmar is a safe country with lots of things to do and see for Singaporeans. Prices are relatively low compared to a similar visit to Perth and cities of Western Australia. 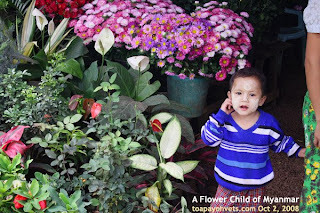 The rainy season is from April to October but prices are much cheaper. The peak tourist season is from November to April and hotel accommodation can be much higher. 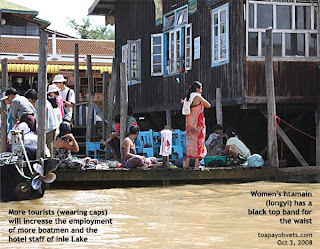 There is a niche market for Singaporean-Myanmarese tour and travel business, esp. for personalised vacation tours if you, the reader, see a glass of water as half full rather than half empty. 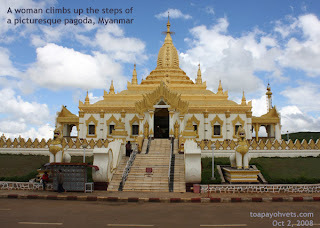 While alighting from the boat after a visit to a water-located pagoda on Day 1, I stepped on a step provided. As I had strained my left foot in Singapore for some time, I could not balance myself and fell holding onto my camera with my left hand. My camera lens cover hit the concrete steps while I fell sideways. It was surprising that I did not fall into the river. The camera was all right but I had a very painful ankle. This was the first day. Would this mission be aborted? "See a doctor," Tour Guide 2 advised. "No need," I said. But I was worse than a lame race horse and there were a few hundred miles of trekking to do. I wrote down the names of drugs and asked Tour Guide 2 to get me some NSAID pain-killers. Tour Guide 1 got a masseur for me. A dark man with a gigantic neck and large hands, looking like the Incredible Hulk in the latest movie version. He could easily crush me anytime as he massaged my legs for half an hour. The massage with lots of oil left was excellent as the masseur knew which muscles of both legs to loosen. Unfortunately, my left foot was still very painful in the evening when I returned to the hotel. There was no time to wait for the massage to work. I took two tablets of NSAID Voltaren pain killers given by Tour Guide 2. Pain reduced 90% overnight and was fit for duty. With a slight limp. 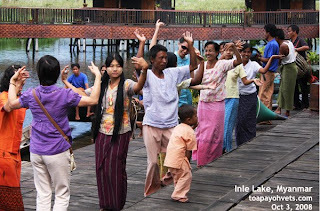 In this trip, I tried to take pictures to show the culture and life-style of the people of Myanmar. 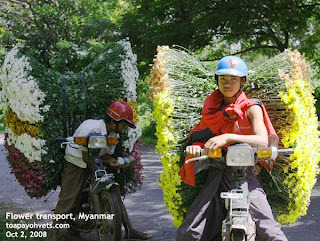 For example, I asked the driver to stop as I saw two flower transport boys resting on the roadside. It was now or never as most of them were in motion, taking flowers to the wholesaler or somewhere. These two boys probably could not afford further their education and had to work to support the family. Many pictures are in this blog which is still a draft as at November 10, 2008.